A Colorado Springs, Colo., man was arrested Tuesday after admitting to local station KRDO that he was the one who posted racially charged signs outside two churches and around the city, KRDO reports. Vincent Broughton, who is black, faces charges of committing a bias-motivated crime, disorderly conduct, harassment and littering, the news site notes. The signs were first put up outside New Covenant Church of God in Christ and referenced the Ku Klux Klan. On Monday three signs were found outside the Relevant Word Christian Cultural Center. Broughton didn't seem to be attempting to hide his association with the signs, however, since one of the signs he posted listed his phone number. "I did it. Probably about 100 or so, I'd come downtown every day and put up the posters," he told the news station. "I want people to know how corrupt these people that run the town are, the Police Department, City Council and people in the community." Messages on the signs include "Black Men Be Aware. You Are the Target," "This Church Works for the KKK” and "This Church Identified as Devil's [sic] for the KKK, the Police … "
Relevant Word Christian Cultural Center Pastor Promise Lee shrugged off the signs because most people already knew who was behind of them. "I wasn't surprised and I certainly didn't become fearful because the community pretty much knows who this gentlemen is putting these posters around the town," the pastor told the news station, adding that it's happened before. "I think the individual utilized the South Carolina shooting as an opportunity to try and instill some fear, and at the end of the day … he's seeking attention." 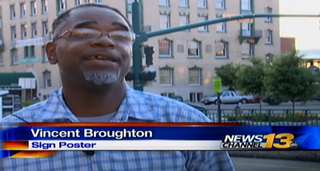 Broughton, for his part, has not said why he targeted churches.